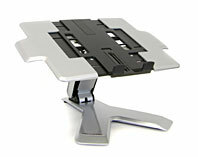 This stand’s six-inch (15 cm) motion range offers true ergonomic adjustment—lift and tilt a notebook screen to eye-level and increase comfort and productivity. 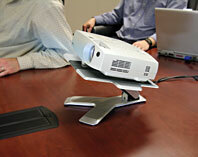 Also use this versatile stand with projectors for fast setup and optimum projecting. 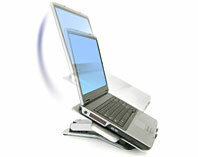 Get the comfort of a full desktop computer system with notebook portability. 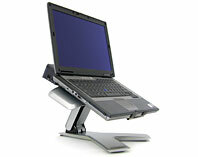 Smooth one-step lift and tilt functionality promotes true ergonomic viewing with Constant Force (CF) Technology. 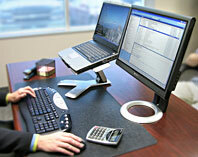 Create a productive dual-display configuration by placing your notebook’s screen alongside an existing LCD. 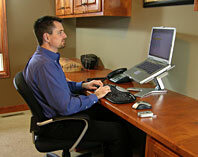 Superior technical design enables use with or without a docking station. Stable platform allows for writing on a convertible notebook. Vented platform allows for cooling air flow. Make group-viewing of family photos or the internet more enjoyable and easy. 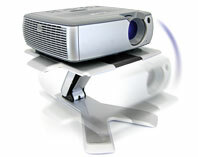 For projectors: Generous height and tilt range minimizes skewed images and obstructions—reduces or eliminates the need for keystone corrections within the projector.